Summary: Graduation day brings Jason St. Peter to Starfleet Academy to witness a memorable day in the life of his daughter, Jessica St. Peter. As he witnesses the ceremony with fatherly pride, his thoughts turn to the previous two decades of his life, watching his little girl grow up. Picture is Willow Tree figurine "Father & Daughter." Summary: The Borg return with a vengeance, striking the Vega Colony deep in the heart of Federation space. The USS Rafale, an Akira-class starship, is mobilized with a fleet to defend the planet. Summary: The attack on Vega Colony is the turning point in many an officer's career in the game Star Trek Online. This is the battle as reflected on by Lieutenant Obruz Dossu, a Bajoran security officer on the medical ship Merveille. Submitted for the Nov/Dec 2011 challenge "Silence." This is the story of one of the survivors of Vega Colony and their part in the battle. 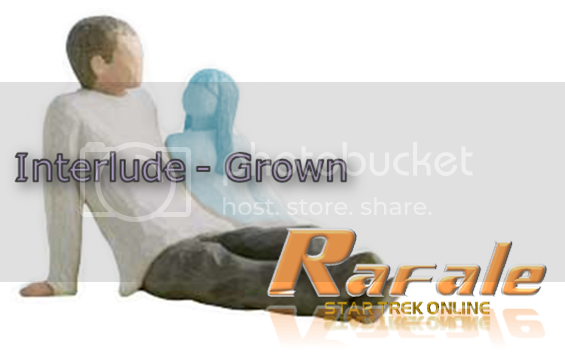 Summary: After the events at Vega Colony, Rafale is in drydock receiving repairs, and what is left of the crew is on shore leave to put the pieces back together. Jessica St. Peter, recently promoted for her heroics above the colony, is on Earth with her friend Justine Dubois, who has slipped into a state of shock at the death of her lover on the Merveille. Summary: The Rafale has been released from dry dock and declared mission ready. St. Peter, now a Lt Commander and in command of the ship, is given a cut and dry task to cut her teeth on - go to the Bassen Rift, the site of the battle between Shinzon's Scimitar and the Enterprise-E, to locate a lost survey vessel. Summary: Nizeri Sano and Wirstowx have been a couple since they first met on the Rafale over two years ago. But how much of Wirstowx's past does Nizeri really know? And what will happen when she scratches the surface of that past? Summary: After a long day, Jessica reflects on events throughout her life, each memory floating on the wings of a butterfly. Written for the Twelve Trials of Triskelion, 2014 event. Submission for February/March 2013 Monthly Challenge, "Paths Not Taken." 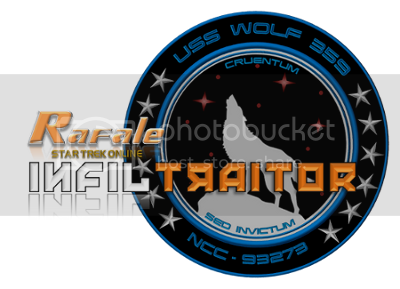 Summary: Rafale locates a damaged shuttle from the Wolf 359 with a single officer claiming he left the ship to get help; members of the crew who are telepath-sensitive have gone insane, executing a hostile takeover of the ship. Worse, the ship's commander, Commander T'Randa Rembrant, might be an Undine infiltrator and the source of the ship's troubles. Summary: How long is long enough, not just for one grieving heart, but two? Summary: Written for Stuff the Stocking 2013, for trekfan. 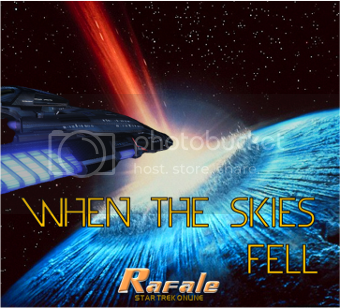 Summary: An asteroid threatens to wipe out an entire civilization that has taken its first small steps into the greater galaxy, and the inhabitants plead with the Rafale crew to save them. But when the asteroid threatens the safety of the starship and crew, will the needs of the many outweigh the needs of the few? Summary: Silly mortals and your holiday traditions! Written for Stuff the Stocking 2013, for FalseBill. Summary: The day to day life of the crew of the U.S.S. Rafale. Started as part of the Twelve Trials of Triskelion Ficlet Flashdance. 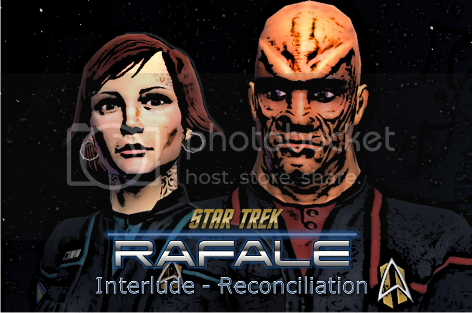 Summary: Background information on the characters of "Rafale; Star Trek Online."